Gears are the most commonly found transmission components. In a typical gear assembly, one toothed wheel interlocks with another. Gearboxes are often used to deliver power or change direction. 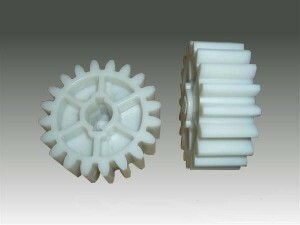 Plastic gears, as the name suggests are made of plastic instead of metal. These include worm gears, spur gears, helical gears, pinion gears, tooth gears, bevel gears, and planetary gears. The material can be a combination of Nylon (Nylon PA6 or Nylon PA66) and POM (Polyoxymethylene). They can easily come in various shapes. Plastic gears are relatively cheap. They produce lower noise compared to metal gears. They are resistant to wear and tear as they have low friction coefficient. These gears are used extensively in various power transmission and motion control systems. Though we have listed just five types of plastic gears, we also offer customized gears as per client’s specifications.